Metabolic Support UK advocates on behalf of patients to ensure their voices are heard in key processes such as NICE and UK Newborn Screening. We collate evidence and data to influence key procedures and access to treatment, fighting for the best outcomes for patient communities. HPP is a genetic, chronic, progressive and life-threatening metabolic disorder which disrupts the process in which minerals such as calcium and phosphorus are deposited in developing bones. This leads to devastating effects on multiple systems of the body such as weak, soft or brittle bones, with debilitating or life-threatening complications. Infants with perinatal – and infantile-onset hypophosphatasia have a high mortality rate, with up to 100% dying within the first year of life. Strensiq (asfotase alfa) is an innovative enzyme replacement therapy for the treatment of patients with perinatal/infantile- and juvenile-onset HPP. This is the first therapy that specifically targets the underlying cause of HPP and can save the lives of patients, usually babies who would otherwise not survive this devastating disease. It also dramatically changes the lives of those severely affected regardless of age. In July 2017 following a two year process, an agreement has been reached between pharmaceutical company Alexion and NHS England, to provide access to the drug, Strensiq for patients with perinatal, infantile and paediatric-onset HPP. Metabolic Support UK (then known as Climb) acted as official consultee and patient representative expert, and included patients of all ages in the process to ensure their voices were heard. This patient input was invaluable to the process which led to the positive decision and outcome for the HPP patient community. “When our son was diagnosed with HPP and put on a trial drug at a few weeks old that saved his life, we never even considered that the trial would come to an end with the risk of the drug not being approved. I had just returned to work when I was contacted by Climb about our son and how the drug has impacted him and his quality of life. They asked if we would be interested in becoming a patient representative at the NICE committee meeting. Not only did Climb gather all the patient evidence on how the drug has impacted on HPP patients of all ages, they held my hand throughout the whole process. They gave me the courage to put our case forward and fight for this drug. 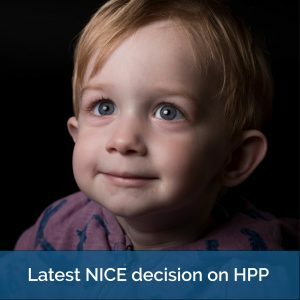 With input from NICE, NHS England, Alexion and Soft Bones UK, we are pleased to present our patient information on the asfotase alfa Managed Access Agreement for treating Hypophosphatasia. To see the asfotase alfa Managed Access Agreement for treating Hypophosphatasia, please click below. We would like to thank all those who have taken the time to contribute feedback to Metabolic Support UK and Soft Bones UK regarding the drug and the Managed Access Agreement. We will continue to collaborate to ensure that we continue to represent the voices of those we support.